Like most people, we're sure that you occasionally struggle to get the lids off jars. Of course you do, just look at the state of you. You've got the grip of a deflated party balloon and you daren't go out in inclement weather for fear of being whisked away by a strong breeze. But now there's no need to be embarrassed... well, clearly there is, you wimp, but what we mean is now there's a place you can go in your very own high street where you can get all your jars opened for you. 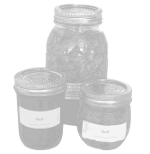 At Jars-4-u we specialise in jars of all shapes and sizes. Pickles! Jam! Sauces! You name it, we've got the torque to deal with it. And for a small fee we can send our specialist, Big Tony, direct to your home to loosen all your lids for you. So the next time you have a jar problem, call in at your local Jars-4-u... if you can get the door open, that is.